Simon & Schuster Books for Young Readers, 9781442412651, 368pp. This “first-rate,” hysterically funny debut novel “that belongs on every multicultural reading list” (Kirkus Reviews) is one of Kirkus’s Best Books of 2013. 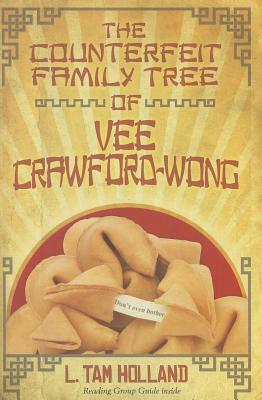 When Vee Crawford-Wong’s history teacher assigns an essay on his family history, Vee knows he’s in trouble. His parents—Chinese-born dad and Texas-bred Mom—are mysteriously and stubbornly close-lipped about his heritage. So, Vee makes up an essay about the grandfather he never knew. The deception begins to spiral out of control when Vee and his best friend, Madison, forge a letter from his relatives in China, asking his father to bring Vee for a visit. Astonishingly, Vee’s father agrees. But halfway around the world is a long way to go to find what Vee has been searching for the whole time—who he really is. L. Tam Holland was born and raised in Honolulu, Hawaii, and actually convinced someone once that every student there rode dolphins to school. After moving to Northern California and earning an undergraduate degree from Stanford, Holland went on to earn an MFA in creative writing from the University of San Francisco. Along with teaching high school English and creative writing, Holland coaches water polo, avoids tofu, and enjoys writing limericks. Visit her at LindsayTamHolland.com. "While characters with mixed heritages are increasingly visible in teen literature, their experience in a rapidly shifting cultural landscape is seldom explored in depth. This first-rate debut does exactly that." "Vee’s narrative voice is lyrical, full of witty snark and credible sophomore angst... Besides being a stylistically compelling coming-of-age narrative with a warm nuclear family dynamic, this will be a boon for collections in need of high quality titles featuring contemporary Asian-American protagonists." "Vee’s story is upbeat, entertaining, and humorous. His personal dilemmas and explicit descriptions and language capture the adolescent male psyche; offer a mixed-ethnicity perspective; portray the social crosscurrents of public high school; and highlight the values of family, forgiveness, and self-respect." "Vee is intelligent and self-effacing, and he’s also the yin to Sherman Alexie’s yang."